T- Blocks provide a 6 inch concrete core for the intersecting wall of a longitudinal wall. T-Walls are used in single residential projects and extensively in multi-family construction projects in the party / demising walls. T-Blocks are also used in forming Pilasters for point loads in commercial and residential construction. 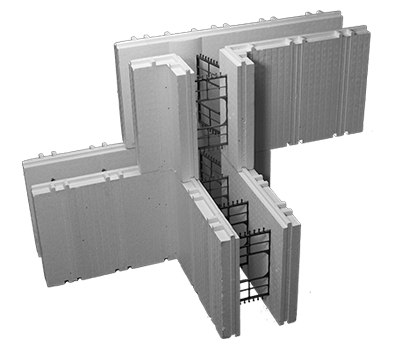 This insulating concrete form configuration will make the construction of a T-wall more efficient by eliminating cutting and bracing in comparison to manually constructing a T-wall with only straight forms.